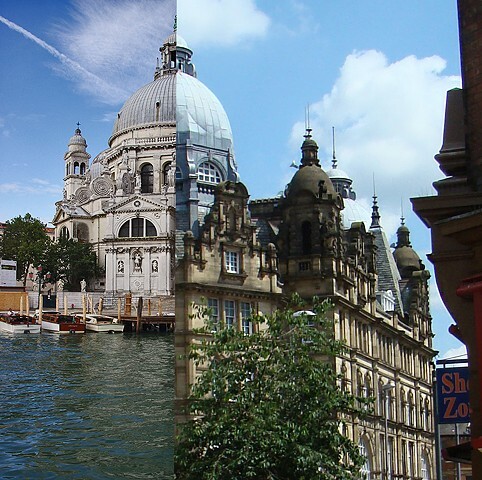 With a commercial vocation similar to the one of Venice, Leeds was ideally made by its architects as a twin city of the most beautiful city of the world. I intend to highlight such proximity with the considered pictures, which bear the same principle of artistic perspective: to reproduce reality, a frame between the eyes and the object is required, as an artificial membrane for pictorial reproduction. For such a purpose, pictorial sources besides photographic reproductions will be considered. An ideal urban dream as the one developed by Renaissance artists has been made real in nineteenth-century Britain, with the attempt of translating a utopia imagined through painting into architecture. The strength of planning the best possible city has been developed both by art and architecture. Such a power is still present: whether is noticed or not, it still stands upon our heads, until architecture, and art, can remind us of its never-ending force.